Attending the Mountain Seat were members of Christina’s family, who had traveled from Europe to be present for this momentous occasion. Congratulatory remarks were offered by the abbots and former abbots, friends, family, honored guests, and Christina’s partner, Marsha Angus. Hoitsu Suzuki, Shunryu Suzuki’s son, was also present for the ceremonies. 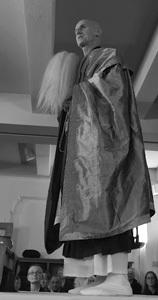 He visits from Japan periodically to guide, assist, and train us in performing and coordinating these important ceremonies and the warm, light-hearted presence of both Hoitsu and his wife, Chitose, is always a pleasure for us. 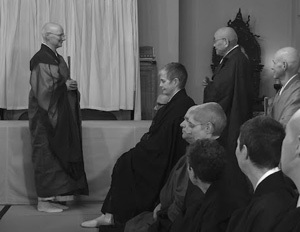 In these two special ceremonies, the entire sangha experienced anew the powerful generosity and wisdom that emerged with Suzuki Roshi and flows forth through the transmission of the Dharma, which has marked Zen Center’s continued development as a Buddhist institution in the West. Photos by Shundo David Haye. 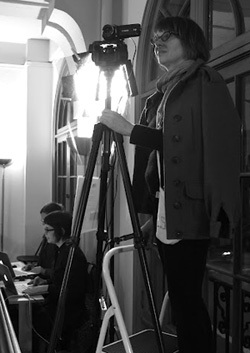 Both ceremonies, as well as Hoitsu’s February 11 Dharma talk, were video live streamed. ADDED February 21, Abbess Kiku Christina Lehnherr’s formal statements [PDF] at various locations during the Mountain Seat Ceremony on February 12.